Though never a boy scout (both literally and figuratively, I suppose), their motto is one I have come to adopt as my own. Sage advice, if you ask me. We may not be able to render ourselves immune from life’s calamities, but that doesn’t mean we can’t lessen their sting. What better way to do that than equipping yourself with all the necessary tools to head off any potential messiness? Which is why I tend to carry a lot of things around with me every day. One of the few advantages women have over men is the accepted policy of carrying a purse. A woman’s pocketbook is almost an extension of her being, and endless chasm of makeup and receipts, Band-Aids and stashes of candy. Or so I assume. Men are not allowed a look into women’s purses. It’s forbidden. Men are not afforded such luxuries. Oh, I’ve seen the Man Bag in the fancy magazines and catalogs. But no one could get away with that around here. Around here, men who carried Man Bags would go by a different name—women. It’s pockets for us males, and my pockets are generally full. 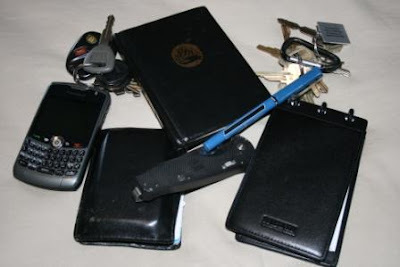 Wallet, Blackberry, personal keys, work keys, knife, notebook, pen, and usually some sort of small book (currently, a shrunken-down edition of Kahlil Gibran’s The Prophet). That’s a lot of baggage, I know. I figure I add at least five pounds of pocket stuff every day. But it’s not just Stuff. Not really. The contents of my pockets are the necessities for daily survival. I’ve tried thinning them out. Tried going without even one item in my pocket inventory. Every attempt has been met with absolute failure. I need my wallet for obvious reasons. It holds my money, my debit card, my insurance card, and my driver’s license. It’s the only thing in a man’s possession that approaches a woman’s purse, and its contents reveal more about his personality than most anything else. My Blackberry is my link to the outside world. Part cell phone and part secretary, going without it would be pure hell. And yes, being a redneck who’s so attached to technology is ironic. But that’s okay. I’m an ironic sort of guy. I need personal keys to get me where I need to go and work keys to get me through the day. I need a good book to satisfy my lonely moments and provide me with some much-needed inspiration. “A room with no books is like a body without a soul,” said Cicero. That goes for a person, too. Pen and notebook? If I’m going to remember anything, I need those. I have the memory of a fruit fly. And a knife? What self-respecting man can walk around without a knife? See what I mean? Subtract one, and I’m in trouble. I was thinking about all of this yesterday evening when I came home from work and emptied all of those things onto the dresser. That seemed like a lot of things to have to haul around to survive a normal day. But then I started thinking about all the other things I carry around to do just that. Things besides what was in my pockets. I carried my faith, for one. Faith that it all means something, that all is not meaningless, and that even if I’m not where I should be, I’ll get there someday. I carry my head to deal with myself, and my heart to deal with others. I carry hope so I can hold my head high, and humility so I can bow it without reservations. I carry understanding so I can know that every person I meet is fighting their own battles and waging their own wars. I carry curiosity and wonder so I can see the beauty that I would otherwise miss. And I carry memories of my past, both the good and the bad, so I can be reminded that the quality of tomorrow depends upon the decisions I make today. Things that don’t fit into my pockets, but in me. I make sure I have all of them before I leave each morning. The necessities. Because just like the things in my pockets, if I subtract just one of them, I’m in trouble.